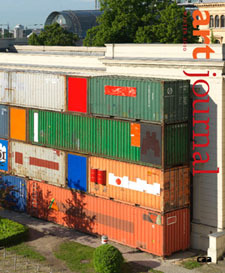 The Winter 2010 issue of Art Journal, CAA’s quarterly of modern and contemporary art, has just been published. A benefit of CAA membership, the publication is mailed to those individual members who elect to receive it and to all institutional members. The Winter 2010 issue also features Kelly Baum’s short essay on Santiago Sierra that includes photographs of the artist’s project, Submission (formerly Word of Fire) from 2006–7, and Jordan Troeller’s exploration of Zoe Leonard’s photographic series, called Analogue. In addition, Chika Okeke-Agulu writes about Who Knows Tomorrow, an exhibition of projects by five African artists, sponsored by the Nationalgalerie in Berlin, that were shown in museums across the city. Okeke-Agulu also interviews Zarina Bhimji, a participating artist whose Waiting (2007) appeared in the Hamburger Banhof. Finally, Michel Oren writes about the activities of the USCO Group, a multimedia art collective from the 1960s. The Winter 2010 issue publishes two artist’s projects: a centerfold by Fabian Marcaccio titled Black Hole $ Paintant and the final installment of Dailies, Kerry James Marshall’s comic for the inside front and back covers. Among the book reviews are Rachel Haidu’s assessment of Christine Mehring’s recent book on Blinky Palermo and Monica McTighe’s analysis of Kate Mondloch’s Screens: Viewing Media Installation Art. Art Journal offers a pair of texts from the print publication—David Reed’s “Soul-Beating,” on his relationship to Philip Guston, and Lauren O’Neill-Butler’s review of Lee Lozano: Notebooks 1967–70—on its new website. In celebration of CAA’s Centennial year, the website also highlights Howard Singerman’s “Art Journal at Fifty,” an essay exploring the history of the publication, and “A Baker’s Dozen from the Archives,” thirteen selections from Art Journal and its predecessors, which you can download as PDFs and read.